Robert Helps Interview with Bruce Duffie . 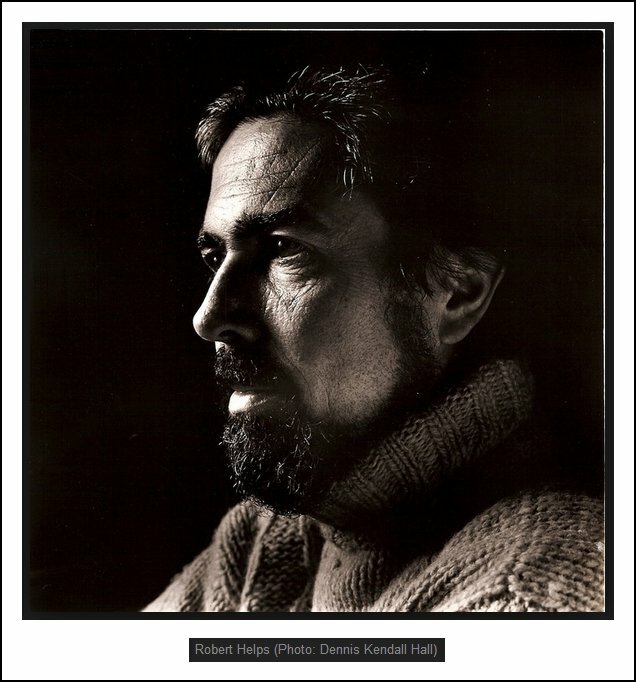 . . . .
Robert Helps (1928-2001) belonged to the small coterie of American new music pianists who emerged in the late forties and early fifties. He was also a highly original composer, whose work might be characterized as the missing link between the Columbia-Princeton atonal school and the “New Romanticism” movement that made tonality fashionable for composers in the 20th century’s final decades. As a much sought-after teacher, Helps embodied the legacy of his teacher Abby Whiteside, whose theories of musculature and physical rhythm stood apart from the mainstream of piano teaching in her day. Likewise, the influence of Roger Sessions on Helps’ career was early and lasting, and Helps was arguably the world’s leading exponent of his mentor’s piano music. From 1980 until his death from cancer at 73 in November 2001, Helps lived, taught, and made music in Tampa, where he was Professor of Music at the University of South Florida. 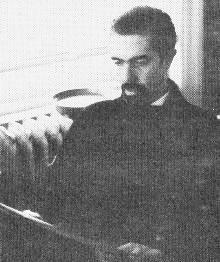 Because he was both a composer in his own right as well as a pianist known for his interpretations of his own and others’ works, Robert Helps appeared several times in my radio series on WNIB, Classical 97 in Chicago. It was always interesting to see who would come up each month as I put together the programming, and what other intended or unintended connections there were among those whose music was being featured. 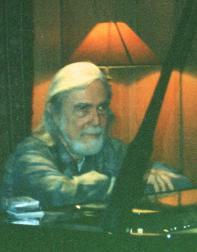 Besides the regular programs featuring his original creations, Helps’ recordings as performer were aired once in a while, especially when the composers included his teacher, Roger Sessions. And yes, I uttered Nicolas Slonimsky’s oft-used pun which he placed in all the biographies of Roger’s students, that they, “Had sessions with Sessions.” Though not knowing specifically who was in the next generation, I mused that those people must have gotten, “helps from Helps.” I also credited the composer Franz Doppler with, “Inventing the Effect bearing his name,” which always brought groans - and strange phone calls - from listeners... (!) Hey, classical music can occasionally include sophisticated humor... But let’s get back to the topic at hand. In January of 1988, I called Robert Helps and arranged for our conversation. He’d not visited Chicago in many years and said he had no plans to return soon, so the chat was held on the telephone. After comparing the cold wintery chill which was blowing outside my window to the warm and sunny day he was enjoying in Florida, we settled down to chat about many musical topics . 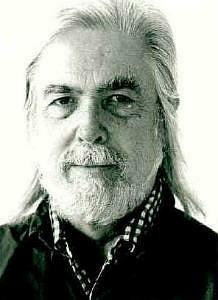 . . . .
Bruce Duffie: You are composer and performer and teacher. In what order should those three be listed in reference books? Robert Helps: This has been a perennial problem year after year after year. I finally gave up on it. I would say that most of the time during my adult life (whatever that is), I have been about half and half of the composer-pianist bit, although recently I’ve been doing more playing than I have been writing. But I would still say half and half there, and teaching has been sort of an adjunct on the side, although it’s of course where I’ve earned money. I like teaching very much, as long as I don’t have to do too much of it. I think one of the key things when it comes to me, which may be both bad and good, is that I don’t like doing one thing all the time. It drives me nuts. BD: You need a variety. RH: I need some variety. I can’t just dig away at the same hole all the time. BD: The teaching is piano? RH: Piano mainly, yes. I’ve sort of stayed away from composition teaching, partially because I didn’t want to get into the university problem of teaching theory and all kinds of things like that, which is fine if people like to do it, but I think that if I kept up the piano and wrote and taught piano, that was enough. Those were three major items, and that should be enough for anybody. So that’s the logic I’ve had on that one. BD: Are you a better composer because you are also a practicing artist? RH: I don’t know whether I would say better, but different, I think. I don’t know whether that’s true, either. I just feel that there are certain things that I’ve not gotten into that I might well have gotten into if I hadn’t performed. For instance, electronic music. I’ve been so, so happy with the instruments that we have had for years and years and years and years and years, playing on them, using them, so forth and so on. It’s never really been a thing for me to go on beyond that. That may be both good and bad. I do think because of playing the piano, I may have a viewpoint on the keyboard that comes from that. Other composers tell me all the time, “Oh, the piano is so hard to write for. It’s a dreadful instrument. How do you write for it?” For me, that’s not a problem at all because I’m so used to playing the damn thing. So I think it does affect it. BD: Do other piano performers, then, compliment you on the fact that your piano style, the writing style is more idiomatic? RH: Sometimes, yes. I do get those comments, yes. RH: It also has led me to occasionally, not all the time but occasionally write extremely difficult music because I know the piano pretty well. Of course, when you do that, you’re always anxious to kind of push the limits now and then, and you write something down that’s absolutely grisly to play. But also I think that when you do play an instrument, you’re not tempted to write something that can’t be played. You’re tempted to write something that’s very, very hard sometimes, but it’s not as though it’s just absolutely out of the question. BD: So there’s nothing in your keyboard writing that you haven’t actually been able to accomplish? RH: Yes. Well, not all the time. There’s one set of pieces that I wrote years ago, Three Etudes, that I decided I just wouldn’t bother to learn to play, simply because they’re very hard, and I just didn’t feel that I wanted to do that. Also, at that time we got a budding young pianist by the name of David Del Tredici, whom you know probably quite well in Chicago, since he’s had pieces performed there. He was about seventeen at the time and an excellent pianist, and he learned the pieces and played them very well, indeed. So I said, “Why should I bother to do it while he’s doing it?” And he’s recorded them on Desto Records. BD: Of the pieces that you do play yourself, are you the ideal interpreter? RH: I would say that sometimes that’s true. There are one or two pieces that I think are so personal to me and my particular style of playing, if I may say something like that, that I like my own performances better than anybody else’s. These are almost always pieces that are extremely moody and very slow. Sometimes I do write a piece that people just don’t think that I could possibly mean what I actually say on the score, and they just don’t get it quite down to the tempo that I would like very much, myself. But most of the time I’ve had very good luck with people playing my pieces very well. Beveridge Webster, Bill Masselos, and so forth and so on, have been really excellent players of my works. So I’ve been lucky in that respect. And I think that’s partially because during the time that I was writing a lot of those pieces, I was in New York doing a lot of playing. When you’re on the scene like that and you see those people, it’s kind of easier to get them to do things. Richard Goode came along and commissioned a piano concerto from me, which was nice. I was unable to hear that piece person to person, but I heard it on tape, and that was a very good performance. BD: Are there ever occasions where interpreters will find things in your scores that you didn’t know you’d hidden there? RH: Yes. There are also times when they would do things, and I like this very much. For instance, if I’ve marked differently on the score, and they find a way to do them that is more natural for them to do it, if it works, I think that’s great. It’s always nice to hear a different viewpoint on it. BD: But this is not to say that your notes are only suggestions, does it? RH: They don’t change my notes, but they’ll change other things like crescendos and diminuendos and that kind of thing. Sometimes the actual pacing of the piece, or also pedaling and things like that, make a big difference in that kind of situation. Sometimes they come up with very nice ideas, and I’m always glad to hear that. BD: So then you encourage this kind of experimentation. BD: Then do you ever change your score to reflect these different ideas? RH: “Take it and make music out of it,” sure. BD: When you’re writing a composition, for whom do you write? Are you writing for the performer, for the audience, for yourself? For whom? RH: That’s a tough one. My favorite story about that comes from my teacher, Roger Sessions, who used to say (and he attributed it to Gertrude Stein), “When you write for an audience or to please somebody, nobody is going to like it. But if you write for yourself in order to please yourself, then you will like it and probably some of the people will.” I think that would be a very good, general thing to go by. I’ve seen many people try and say: “Well, now what can I write that will please this group of people?” And it always seems to turn out a little bit odd, because it’s not quite there somehow or other. BD: Does that turn into pandering? RH: Maybe, if there’s kind of a forcing of style on what you might naturally do that just isn’t quite you. When it’s not quite you, it’s not quite anybody, because you’re writing it. I don’t know, though. That’s a tough one. For instance, just to pick a name, Copland reverted to a simpler style and wrote vernacular music after writing some very difficult music, and people wonder whether he did that in order to please the public, make money, or whatever. I really don’t think that had much to do with it. I think he simply felt like writing that kind of music. I know in my own case, my first three or four pieces were pretty far out, dissonant type pieces. Then my symphony came along, and the second movement happened to be very tonal, B-flat minor to be exact. I don’t know where that came from, but I certainly didn’t sit down and say: “Well, now it’s time to write a nice tonal piece; I think the public might like to hear something tonal.” No way. It just happened to come out that way. BD: When you’re writing any piece, are you in control of the music or is the music in control of you? RH: I would say more the second. The music takes hold of you and sort of leads you about. Composers write in different ways at different times, but for me, I am always surprised at the direction that a piece takes me. I never plan a piece out that way, because it never works out that way. I think that the form of the piece and where it takes you is one of the most creative aspects of the whole piece, and one that you simply have to see what happens. BD: How much planning can you do beforehand? RH: Almost none, when it comes to me. Now, when it comes to a commissioned piece, the people say: “I would like you to write a two-piano piece that lasts between ten and fifteen minutes.” Then I still don’t really plan it. I just did this, by the way. I just wrote a piece like that, and I had the hope that it was going to come out like that, and when I first sat down, I was absolutely convinced that it was going to be a large, one-movement piece, or it would be a piece in about four movements that would be short. It turned out to be a two-movement piece. I happened to be lucky it turned out to be about twelve minutes. But it worries me all the time when you do something like that, because then you do have to sort of see if you can confine yourself a bit to what the commission people want. I don’t know what kind of thing works at that time that makes that sort of happen. I certainly don’t sit down and say: “Now I have a twelve-minute piece to write. It’s going to be three movements, and these movements are going to be four minutes each,” and then block it out form-wise. BD: You don’t do that. RH: I don’t do that, no. That’s not to say that I don’t do things like that sometimes, but that’s not the main impetus of the piece to me at all, because I’m apt to start on the piece at any place. I’m apt to start at the climactic chord or a coda. I remember when I wrote my Concerto No. 2, this is the Richard Goode piece, I started at the cadenza, quite by chance, and wrote to the end of the movement. It looked like it was going to be a one-movement piece, which it was, and I had not a clue in the world at that point as to what this piece was going to start like. It took quite some time to get that going. Then the other major problem in that piece was to join the first part to the last part. It kind of works out all right after that. BD: Without having an enormous seam in the middle? BD: When you’re working on the piece, how do you know when it’s finished? How do you know when to put down the pencil? RH: Put down the pencil? Well, when I write a piece, there’s a lot of sketching going on. I’d have to write on one section and then on another, and then join them together, then go back and change and do this and that and so on. I don’t know, it just seems sort of a natural process that you just kind of know when that has taken place, when all the details sort of seem to fit. I do think that the first part of writing is more or less, generally speaking, the most creative part of the writing. That’s where you are swept along by the ideas and you don’t quite know where you’re going, and you often feel very stupid about the whole thing. The last part of writing is just sort of clean-up, mop-up, detail things, where everything gets put into place, and you’re very sure, hopefully, that every note is exactly the one you want at that time. But I can’t do that part of the piece too soon, because that would be too soon to do that. I do remember one case where I wrote a trio that I thought was going to be in five movements. I finished movement number three and was just about to take up the pen the following day and say, “Well, it’s time to go on to movement number four,” and right then it occurred to me, the piece is over. [Laughter] And it was. There are surprises like that all the time, I think, if you let the piece guide you about. BD: You receive a number of commissions. How do you decide which ones you’ll accept and which you’ll turn down? RH: I’ve never had that problem. I’ve never been so much in demand that I’ve had to make that choice. Commissions come along now and then for me, and they always seem to come along at a reliably slow pace. Sometimes they don’t come along, and I write something anyway, but I’ve not been the type of composer that has so many people desperately wanting their pieces that I’ve had to do that. Recently, that’s been the case a little bit more, because at school the wind ensemble person wants a piece, and the percussion ensemble man wants a piece and so forth and so on. I’ve had to pick and choose among those things. BD: Not if you keep the lid down! RH: [Laughter] And put a large rug on the piano at the same time. But it’s kind of an interesting challenge, and there’s a very good guitar player down here, so that also makes it more interesting. BD: Coming back to the four-handed piano music, aside from the very obvious, what are the real differences between music for one piano four hands, and two pianos? RH: I think there are similar problems. In both cases, there are almost too many notes available to you, for a change, whereas when it comes to left-hand piano pieces, of course the opposite holds true. Even for solo piano there are times when it seems that you would just love to have a free nose in order to play one note that you just can’t quite stretch in there. [Laughter] But in the other cases, especially with four hands, you have the problem that you can spread out on the keyboard so much that, if you’re not careful, it begins to sound like a piano player roll. So there’s that problem. 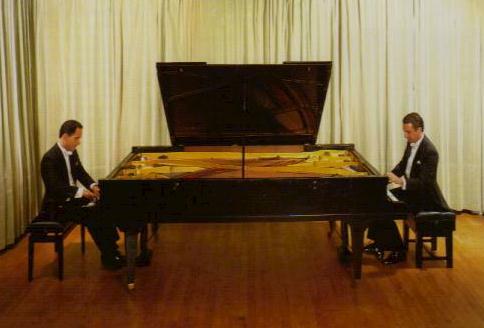 And with the two-piano thing, for me there’s a different problem, which is that you can duplicate pitches. 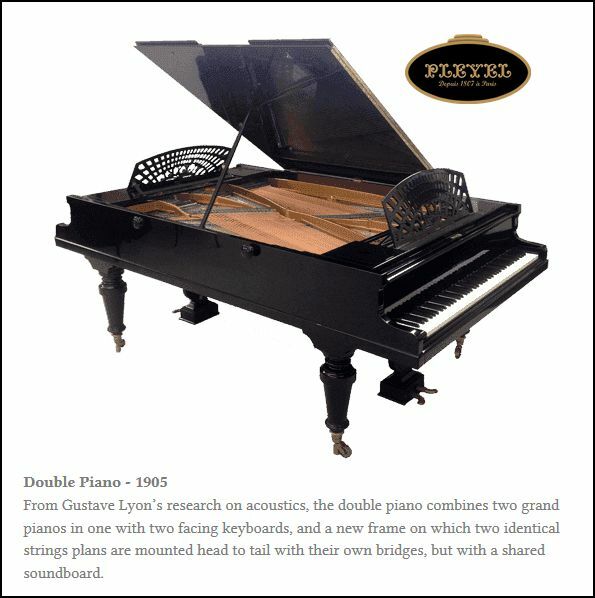 No two pianos are the same, and no two pianos are ever quite in tune together, so you get kind of a buzzy quality there that I think has to be avoided somewhat. BD: Has there ever been someone who has designed a set of eighty-eight notes with two keyboards, one at either end? RH: Oh, my God. No. I don’t think so. I don’t think so. It would be an interesting thought. BD: That would eliminate the problem of the tuning. RH: Yes, that’s true. I must say that you’ve come up with an idea that has never occurred to me. RH: Then the dampers become a problem. But it’s an interesting idea that maybe could be worked out somehow or other. BD: You work with various tonal and atonal systems, but only with the existing systems. RH: Yes, I do. Yes, totally. BD: So you don’t feel we have exhausted this idea. RH: I don’t think so, no. People sometimes ask me what kind of music I write, and I’m always much more capable of talking about what it’s not than what it is. It’s not twelve-tone music. It’s not serial music, although once in a while I do delve into something that is not tonal music really, but it comes quite close to it. It’s not minimal. It’s very hard for me to say what it is. My very good friend, Milton Babbitt, calls it "contextual music," whatever that means. In his way of thinking, I set up a kind of a context of sound and then work within that, whether it happens to be somewhat tonal or having tonal centers, or whether it doesn’t, but I do not do anything purely theoretical, like rely on number systems. It seems to have always gone against my grain to do that. BD: For you, where is the balance between the artistic achievement and the entertainment value in either music in general or your music specifically? RH: With me, I don’t really think about that too much. As to my own background, when I was a pre-teenager of six, seven, eight, nine, ten, eleven, I was into the performance angle much more than I was to anything else. I got into the performing for audience thing, and I suppose that already makes that an entertainment medium in a way. I have never consciously sat down and asked myself, “Now, am I going to write music that’s going to entertain you, or am I going to write scholarly music?” To me, it’s all just music. I just sort of do it. Sometimes it entertains people and sometimes it doesn’t quite do that, and sometimes it entertains some people and definitely does not entertain others. But that’s the way it goes. BD: Let me ask you the great big philosophical question. What is the purpose of music in society? RH: That’s a tough one. Going back to the Gertrude Stein thing, I think if a composer has really delved into music over the years and performed music over the years, I think he has an unconscious flair or feeling for what moves people, for what gets to people. I think the two most important things in music are mood and pacing. If you succeed in both of those things it will get you an audience and it will move an audience, because mood will move an audience. What I mean by pacing is, in a sense, form, but it’s also a sort of creative form that grabs the person, pulls them along and makes them look ahead at the piece, rather than being just stuck where they are, listening to it. In other words, I think in a really good piece of music, you’re always wondering: “What’s going to happen next?” You’re not just stuck where you are, hearing a nice chord. This is just as true of Chopin as it is of Schoenberg. You’re always saying: “Oh, that’s lovely, but what’s going to happen around the corner?” You have to grab a person both ways. You have to grab them in the present, and you have to grab them in the future. I just think that people that are very musical (whatever that word means) are geared to try their best to do that. BD: Have we been talking, then, about some of the things which constitute greatness in music? RH: I think so. It seems to me that when a piece does that, when the mood of the piece grabs you somehow or other, whether it’s dramatically or sensitively or theatrically or whatever, and you’re really channeled along and you don’t lose interest - anything but don’t lose interest; you just can hardly wait to hear what’s coming next - that’s got to be not a bad piece. Wouldn’t you say so? BD: Is that art, or is that craft? RH: It may be a little of each, of course. Craft is always there, you know. But I think there’s a difference between craft which is extremely conscious about itself - in other words, for me that would be pre-planning the form of the piece and using prescribed formulas - and craft that is just developed out of a lot of experience and just sort of comes on you in a sort of natural way. Of course, it gets really terribly complicated in terms of the difference between something that’s totally spontaneous and totally natural, and something that is thought out very, very well. I think all those things eventually happen in the piece. It’s just that I don’t want to think things out first all that much; I want the piece to sort of take over for a while. Then it gets to a point where I simply have to say: “Well, now, we’ve done that process. Now let’s get down and straighten out all the stupid little details that have not quite worked themselves out in that process.” So I think both of those processes work. BD: Let me come back a little bit to your interpretation. Are you a better interpreter of other people’s music because you are also a composer of your own music? RH: Oh, I think so. This works in very strange ways. For instance, I don’t always think that I am the best interpreter of the music that I may like the best, which seems very odd to me. Just as an example - now this is just my own thoughts about this; it may not be anybody else’s thoughts - I think I perform French music very, very well. I have often felt that I don’t perform Beethoven and Schubert, perhaps, as well, although sometimes I think I perform that really quite well, too. Whereas, if you were to ask me who were the greater composers, Beethoven and Schubert or Debussy and Ravel, I think that’s a close call in certain ways, but I think I would probably have to say the first two. But I don’t think, in some ways, that I do them quite as well as I could do the others. Who knows why? I don’t know why. BD: Are you always out hunting for new pieces? RH: No, I’m not, because they always seem to find me. One way or another, something comes by. Once in a while, that happens. Once in a while I will say: “I would really like to do something totally different.” I remember about two years ago, a piece by Albéniz came by my door. I had never done anything like that at all. It was a very beautiful piece. Right this minute, I can’t even think of what it was called, but it was about an eighteen-minute, one-movement piece, which was kind of different for him. And I loved learning it. It was something that I had never done before. I had to try and get a little Spanish blood stirring, and I enjoyed doing it. BD: Now you bring up another subject... Is your music, the music you compose, particularly American? RH: I don’t think so, really. I think that I tend to write two styles in a certain kind of way. One has a very strong French influence, or even Scriabin sound in certain kind of ways. Not really. When I say this, I sort of hate to because it doesn’t really sound like that at all, but there’s a certain textural thing which I think is like that. And once in a while I write extremely dissonant, crude sounding music. And those are the kind of two sounds that I seem to get into. RH: Very seldom. Once they’re really done, I very seldom do that. BD: Let us talk about some of the music that you’ve got recorded. First of all, the two-record box set New Music for the Piano. Was that an especially fun thing to put together, because it’s a lot of little pieces by all kinds of people? 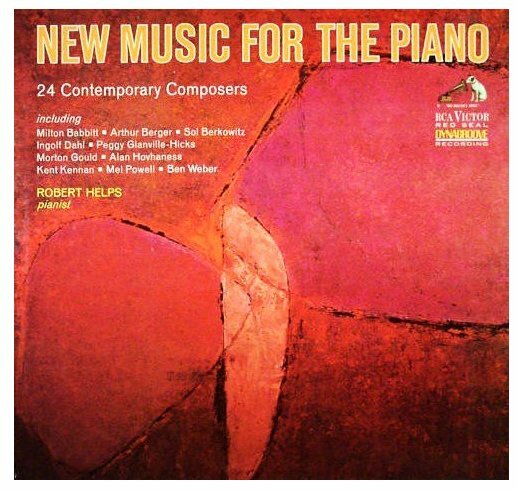 Robert Helps in a 20th Century compendium "New Music for the Piano: 24 Contemporary Composers," Ingolf Dahl's Fanfares (1958), Arthur Berger's Two Episodes (1933), Kent Kennan's Two Preludes (1951), Samuel Adler's Capriccio (1954), Hall Overton's Polarities No. 1 (1958), Milton Babbit's Partitions (1957), Miriam Gideon's Piano Suite No. 3 (1951), Sol Berkowitz's Syncopations (1958), Ben Weber's Humoreske op. 49 (1958), Leo Kraft's Allegro Giocoso (1957), Paul A. Pisk's Nocturnal Interlude (undated), Mel Powell's Etude (1957), Morton Gould's Rag-Blues-Rag (undated), Vivian Fine's Sinfonia and Fugato (undated), Alan Hovhaness' Allegro on a Pakistan Little Tune op. 104 No. 6 (1952), George Perle's Six Preludes op. 20B (1946), Norman Cazden's Sonata op. 53 No.3 (1950), Joseph Prostakoff's Two Bagatelles (undated), Ernst Bacon's The Pig Town Fling (undated), Helps's Image (1957), Mark Brunswick's Six Bagatelles (1958), Earl Kim's Two Bagatelles (1950/1948), and Josef Alexander's Incantation(1964). Underwritten by The Abbey Whiteside Foundation. Cover art is by Sid Maurer. Glossy full-size 10-page booklet with extensive notes on all composers and works featured herein, written by Joseph Prostakoff. The RCA LP was originally issued in 1966, and later re-issued on CRI in 1971. When it was re-mastered and issued on a CRI CD in 2001, the works by Berger, Kraft, and Fine were omitted. RH: Right. Joseph Prostakoff is the editor of the published album, which Lawson-Gould publishes. Years ago, Joseph went around and asked people to write short pieces or, if they had a short piece, that was fine, for a possible publication. It finally was done that way. Then, after the printed text had been published, Joseph thought that it would be nice to see if he could get somebody to record it, and he asked me whether I would do it. I said, “Why, sure, Joseph, I’d love to,” never dreaming that he would find anybody to do that project. 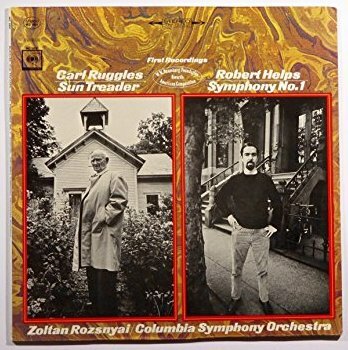 And lo and behold, because of Morton Gould, who’s in that book and who is a very good friend of Joseph - who happens to be dead now, sadly - but Morton somehow pulled some of his RCA Victor connections, and they did it, of all people. That stayed in the catalog about ten years, maybe, and then it was dropped, and CRI took it on. I don’t know whether you have the white-covered CRI copy or the red-covered Victor copy. It doesn’t matter. BD: The RCA copy is at the station (WNIB) and I have the white copy at home. Is there any difference at all in the two editions? RH: No, it’s exactly the same. But it was a different kind of a project for me because when you do twenty-four people’s works like that, pieces that you don’t select yourself, there are bound to be certain works that you will like very much, certain works that you think are okay, and certain works that you just don’t like much or just don’t like at all. Since I had not had that much experience in having to play some pieces that I didn’t like all that much, it was a very interesting project. I found that I had to spend much more time on the pieces that I did not like in order to find some way to play them that I liked. BD: It probably just seemed that way. RH: Yes. [Laughter] You may have a point there. Boredom is a problem for all of us, right? BD: This brings up another question that I wanted to ask later, but let’s do it now. When you’re arranging a concert program, how do you decide which pieces you’ll play, which pieces you won’t play? BD: Great minds think alike. Obviously it was a good idea, then. RH: I guess so. I don’t know. BD: Do you try, on most of your programs, to include one of your own compositions? RH: No, I don’t. There are times when I do play my own works, but, as a matter of fact, usually, unless somebody really asks me to play a piece of mine, I don’t tend to program it. RH: I figure that’s kind of pushing it a little, maybe. And I get to play my pieces often enough somehow or other, so it’s kind of more fun to play other people’s pieces. BD: I would just think, though, it would almost be standard procedure to have you play at least something of yours, even if it’s just a tiny piece. RH: I don’t do it all the time. I just don’t. As a matter of fact, last year I had to play seven solo recitals in a row for some sort of course at one of our sister colleges down here, and I did a program of Schubert and Fauré and Ravel and whatnot, and one of those programs was an all-Helps program, which was the first and about the only time that I’ll ever do that. BD: With your interest in contemporary music, do you always try to put a new or recent piece on? RH: Yes, I do, unless there’s some other theme that comes. BD: The next record I have is Music of Robert Helps on Desto. It has the Three Etudes played by David Del Tredici, Recollections played by Robert Masselos, and the Quartet played by you. I read someplace else that in the Quartet, you broke up the piano into four equal parts of 22 keys each. RH: You know, I hate to say this, but if I did that, it was absolute news to me when I read it in print. I went back to look at the piece rather carefully, because I thought to myself, “Is it possible that such an elaborate procedure as that would entail was something that I did in a non-conscious fashion?” And I couldn’t see it. I could see some places where I had four textures going that were, of course, separated on the keyboard sometimes, but there was nothing that went on for any length of time that made me see that possibility. BD: So really, then, that statement is an unsubstantiated hypothesis. RH: As far as I’m concerned, it is, unless the person that made it can document it for me. I can’t quite see it, unless he’s looking at it in an entirely different way that I can’t quite see. The person that wrote that statement is an excellent person, Richard Swift, you know. BD: Have you ever contacted him? RH: No, I haven’t seen him since I read that. BD: You should ask him what the hell he’s talking about! BD: Since that’s in print, it will haunt you forever. On the other hand, are you basically pleased with the performances you hear of your music? RH: Sometimes yes and sometimes no, but I must say I have been luckier than lots of people are in that respect, because most of the times when I hear performances of mine, even when it’s not, as in my own case, always the ideal performance or the ideal night or something happens that isn’t quite right, they’ve been usually very good, I think. BD: Coming to the other side of the coin, then, have you basically been pleased with the records that have been made of your music? RH: Mainly, especially when it comes to the piano records. I’m very pleased with Tredici’s performance. As a matter of fact, that record, I think, is probably, in some respects, my favorite record of stuff by me, not only because the whole record is stuff by me but because the playing I think is good on all the pieces. BD: If Quartet is not set to four groups of twenty-two notes, what is the significance of the title? RH: The significance of the title is really very vague. I almost called it Sonata, and in many respects I’m quite sorry that I didn’t do that. But somehow or other, the word “quartet” came up, and to me, it has to do with just a very simple thing, that there are four pieces and that there’s a lot of four-part writing in it. Not that there isn’t a lot of four-part writing in other pieces of mine, but just the combination of the fact that, yes, there are four pieces in this set and, yes, there’s a lot of four-part writing that made me write that title. I guess I was also being a little bit on the perverse side, because when you see the word “quartet,” you almost always think it has to be four instruments playing. I think that if I could change the title now, I would, but I’m not going to do that. BD: Another Desto disc has the Portrait. RH: The Portrait on it, right, yes. That I think is a very accessible piece of mine. As a matter of fact, I would almost, almost call it popular. When I play it or when I hear other people play it, it almost always gets a very good audience response out of an audience that’s not generally used to hearing modern music. I don’t know whether that’s a good point or whether that’s the kiss of death. BD: In your canon, though, is it just really another piece? BD: It’s not something that you disown. RH: No, no. I played that myself last year. BD: Then there’s the Symphony No. 1. Are there any differences between the CRI re-issue and the old CBS disc? RH: No, it’s exactly the same. BD: Is one better sound than the other? RH: I haven’t really done a very serious study on that point, but people that are into it have told me that they like the CRI pressing better. I have some preference for the RCA pressing on the new music box set, but the CRI pressing is real good, too, so there’s not that much difference. They are all excellent pressings. BD: Is it important for a composer to get his works recorded? RH: I think that it is important today to have that done because it gets the work around infinitely more than just one performance. Almost all composers these days, given a chance of having fourteen excellent performances of a piece all over the world, and a good record of the piece, there wouldn’t be any choice. Go for the record. It also seems to be one thing that, when you want grants or when you want scholarships or foundation money or anything like that, it doesn’t hurt to have a commercial recording. I really do think that that does make a difference when it comes to those things, quite a lot of difference. Aside from that, of course, it’s also very nice for the composer to have something that he can give away as gifts and to a library. BD: Then there is the CRI recording of Gossamer Noons, which is a work for voice and orchestra. Tell me a bit about that. RH: I’m glad you have that one. That’s a piece with a text by my dear friend, James Purdy, who is a novelist and author in New York. The piece is about fifteen minutes, maybe a little bit more than that, and was recorded by Bethany Beardslee, a wonderful soprano, and Gunther Schuller and the American Composers Orchestra. It was performed in New York at one time, and they made the recording after that. It’s a very good recording, and it’s one of my favorite pieces of mine. There’s also a New World record of The Running Sun, which is a short set of five songs also to text by James Purdy, recorded, once again, by Bethany Beardslee, with me at the piano. On that particular disk there is a whole side done by Beardslee and me, mainly of early twentieth-century pieces, and my piece actually got on that record because we just didn’t have quite enough pieces at the last minute. RH: [Laughter.] Once again, I’ve been lucky in that, because of my doing a lot of concerts. I’ve had some associations with very fine singers, especially Bethany Beardslee and some other singers, too. The result is that what few works I’ve done for voice have been done for soprano voice. Now and then I’m asked, “May I please have a tenor work?” and I say, “Sorry, I just don’t have one.” I’ve just not written all that much for voice, although I think it’s a wonderful medium. I just haven’t done it. It’s not a very wonderful answer to your question. BD: It’s a truthful answer. That’s what I’m looking for. RH: It all depends on the definition of that word, because I know that when I’m writing music, I very often feel something which I guess can be called "fun." I feel that I’m doing the right thing. It just feels good to be doing it, although when you do write a piece, it usually takes hold of you and you’re kind of a social miscast. You don’t really want to go out and do things. But it feels good to be writing again, although it’s kind of like being in the throes of a hurricane all the time. But I’ll tell you what’s not fun, and composers will really more or less agree on this, and I think one is very much helped when one realizes, as time goes by, and that is the prospect of sitting down to write a new piece. That is not fun because you know that when you do start writing it, it’s just going to take hold of you, and that’s going to be that for a long time. I remember my friend, James Purdy, the author, said: “You feel so stupid at first.” You just feel you don’t know anything when you start writing. You start this way, and it’s wrong. You do this and it’s wrong. It takes a long time to kind of get it going. Once the actual process gets going, I would call it fun, but the thought of getting it going is not fun, at least for me. As a result, I have never been able to do composition the way some people apparently can do it, which is to set aside nine to half past ten in the morning each day of the year (or of the week) and do that, and then go on to teaching and maybe playing a concert. 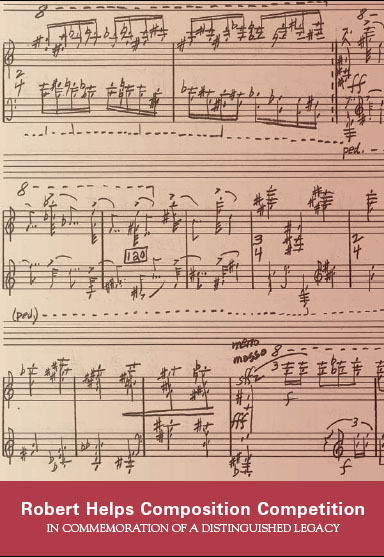 Stravinsky apparently did this very well, but I am the type that when I write music, it seems that I have to have the luxury of having almost all my time free so that the piece circulates through me, even when I’m not consciously thinking about it. And I know that there are a lot of people that feel that way. BD: You need to be inspired by the moment? RH: I need to have all my time free, which is, as we all know, kind of a luxury. I mean, not all the time. I’m perfectly willing to cook and shop and go out and do a few things, but I mean by that that I’ve never been too successful at teaching, playing, and writing music at the same time. BD: You can do one or the other, but not both. RH: Yes, I think so, basically. If I weren’t that way about it, I’m quite sure that I would have quite a few more works in the catalog, but that’s the way it is, so I have to live with that, I guess. BD: As you approach your sixtieth birthday, what is, perhaps, the most surprising or most pleasing thing that you’ve noticed about either your music or music in general? RH: Hmmmm. This is just the first thing that occurs to me, which I think is the best way to answer a question like that. I think that the most surprising thing is the direction music seems to be taking at the moment. When I was twenty-five or something like that and it was the post-Bartókian years and Schoenberg was still around, I would not have been able to remotely predict the sort of huge amount of differences in the music being written these days. There doesn’t seem to be any sort of essential trend, which is good, I think, in many ways. But it seems to me that, at that time, there were certain sort of prescribed and somewhat limited ways that we might go, which was also a help, in lots of ways. I think now there are so many ways of going, and perhaps not so many of those central figures. There doesn’t seem that there are people around right this minute. Maybe there are. Maybe they will come to life, and maybe there are people that I know that will be that way that I don’t quite see that way, but there don’t seem to be people quite like Sessions and Schoenberg and Bartók around. There don’t seem to be central figures like that, and that’s a little surprising to me that there is not the emergence of extremely strong, centralizing people. I think that’s probably one of the most surprising things to me. On the other hand, it’s a very interesting time to live in, where there are many trends going on at once. RH: Follow your own thoughts, absolutely. BD: Is that advice you live by? RH: Yes, I think so. Of course, those thoughts are always influenced very strongly, I’m sure, by one’s teachers and what one has done and where one’s mental set is at the time. But I think if you just get in there and let things happen, it’s the only way to do it. BD: Do you feel that you’re part of a lineage of composers? RH: I’ve never really thought that much about that topic. I think I have had a very strong lineage from the Sessions teaching and from the Sessions group back in the forties and fifties, and I think I have a very strong allegiance to a lot of his ideas about music. I don’t feel that as time has gone by that I sound much like him, but everything I’ve said today, when it comes to composition, could, I think, go back to that lineage. There’s nothing that I say about composition that’s all that different from him, strangely enough. I think one of the things that he was great at was that he was probably this country’s leading teacher for many years, and one of the reasons why that was possible for him was that he never imposed any style on his students. He always seemed to be able to get into the piece that the student was working and point out what he considered were places where it started to be not true to itself. He was not at all interested in whether it was true to him or not. He was only interested in what the music meant to the person writing it. BD: That’s what makes a great teacher? RH: I think so, when it comes to composition. I think what does not make a great teacher is when they impose a certain kind of a style on you. That does not help. I love the statement that I heard Schoenberg make one time. He once apparently said that it’s important to teach a student what the student needs to learn, not what the teacher knows. BD: Ah! But the ability to see that is rare. RH: The ability to see that is tough, I think. Especially when he simply didn’t like the style very much. I would think that would happen very often, and I know it did when it came to Sessions, but he still entered it, and didn’t say: “This is just awful” because of the style. BD: I want to thank you for spending the time with me this afternoon. RH: Thank you very much. It’s been really nice talking to you. You asked some very provocative questions, questions that I don’t really sit down and think about all that often. In commemoration of the distinguished legacy of the eminent pianist and composer Robert Helps, the University of South Florida is pleased to announce the first annual international composition competition and festival for composers age 18-35. The Robert Helps Composition Competition and Festival are designed to encourage the development and enhance the career opportunities of emerging young composers, honoring the oeuvre and aesthetic of the late Robert Helps, while providing an annual archival commemoration in celebration of the pianism and pedagogy of Helps, the master teacher, as well as offering the University of South Florida as a significant and valuable resource for composers and lovers of the music of our time. The University of South Florida School of Music provides an appropriate forum for an international composition competition and festival commemorating and honoring the distinguished legacy of the late pianist-composer Robert Helps, one of the revered figures in American music and a beloved USF faculty member. Entering its sixth decade, the University of South Florida School of Music continues to be a beacon for leading composers, performers of new music, resident composers, theorists and artist-faculty, and listeners – all of whom participate in evolving, cutting-edge modernism. By establishing the Robert Helps Competition and Festival, the University of South Florida offers a valuable resource and provocative catalyst for thoughtful exchange in new music. This university’s historic commitment to modern works has generated literally thousands of performances, commissions and premieres at the USF campus and throughout the Tampa metropolitan area by resident artist-faculty and composers, guest artists and students. This institution’s track record of presenting the most challenging European and American literature spanning all genre through the 20th century to the present is well known, and also extends to repertories of the diverse geographies of Cuba, the Caribbean, Latin America, Korea, China, post-1980 Soviet, modern Baltic, and beyond. Composers, theorists, musicologists and performers have come to depend on this research institution’s innovative and creative work not only in performance, but also in theoretical research that focuses on modern thought and emerging shifts of approach in music. The University of South Florida is home to one of the most complete electronic studios in the country (SYCOM), and has recently been designated as the permanent home to the New York Bartók Archive and to the Robert Helps Archive in the USF Library Special Collections. For other information about Robert Helps, visit this website [http://helpsweb.free.fr/]. This interview was held on the telephone on January 23, 1988. Portions of the interview, along with musical recordings, were used on WNIB later that year, and again at five year intervals (in 1993 and 1998), befitting my 'round birthday' presentation series. Another program was also featured on WNUR-FM in October, 2006. Unedited copies of the audio tape have been placed in the Music Library at Northwestern University, and in the Oral History American Music Archive at Yale University. This transcription was made at the end of 2006 and posted on this site in January of 2007.